Who’d want to be a drone at the end of summer? This drone has been harassed out of the hive by his sisters, who bit and tugged at him, dragging him away from the sweet benefits of their labour. Collapsed on the hive landing board, he makes a sad sight. His brothers have already come to an end. Their dried out, desiccated bodies litter the floor. And he has attracted the attention of a wasp, who perhaps views his large abdomen as a moving honey pot of juicy reproductive organs. The wasp is smaller, but has the advantage of a sting. He tries to move away, but he has been weakened by his earlier struggles with his sisters, and his feeble motions are no match for the persistent wasp. A second wasp joins in. His future looks set for a grisly end. I’m afraid there is no happy ending. Here are some pretty flowers to make up for it. Everyone is out blackberry picking in the local fields. 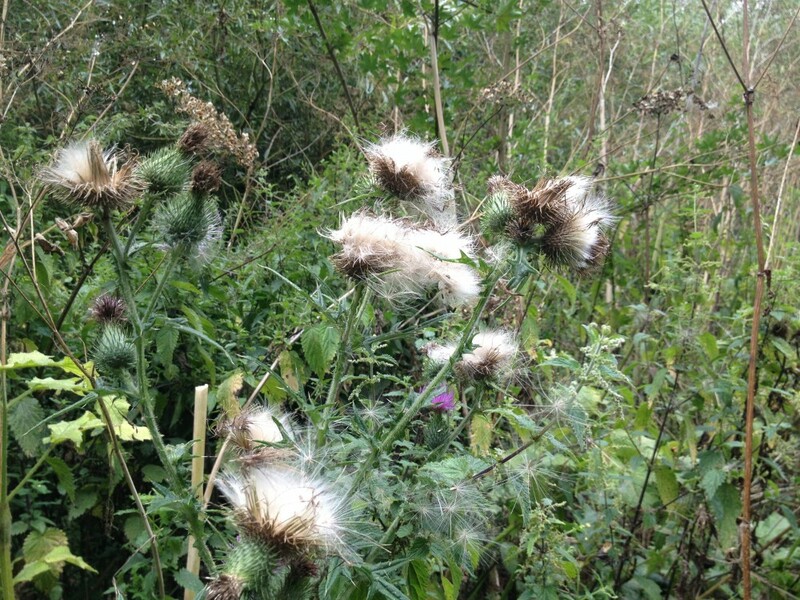 Spiky though the thistles are, their flowers turn into soft downy seeds that drift on the breeze. Summer blowing away. This entry was posted in Uncategorized and tagged drones. Bookmark the permalink. A sad story, but I know it’s necessary for the survival of the colony. They can’t afford to waste food on them during the winter. The drones seemed to get ejected quite early this year, even in the beginning of July one of my colonies was pushing them out. Perhaps it depends on hive genetics and how well the workers think they’re doing for stores. It would make sense for stores to play an important role in this decision. 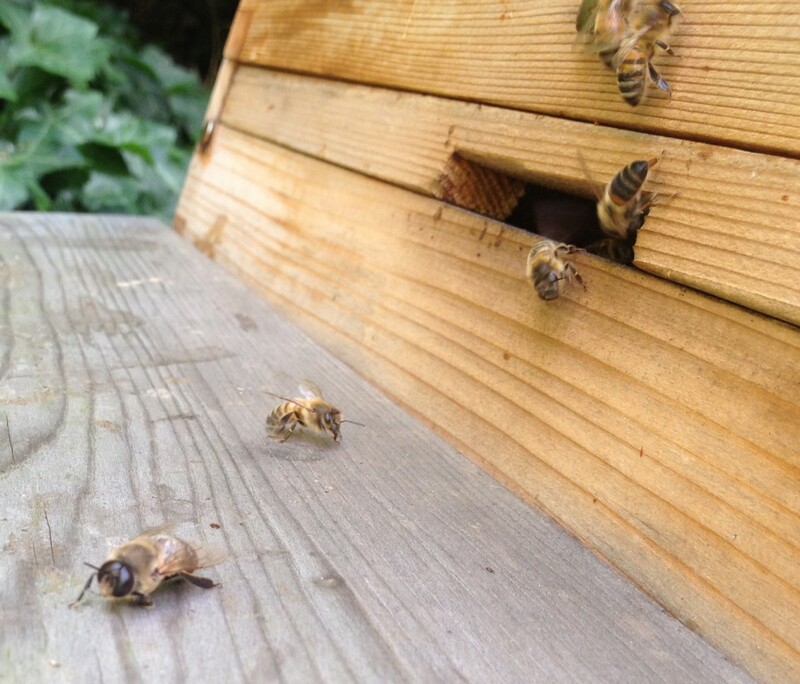 What are the odds of a queen mating in late August being able to keep a hive going for the winter? I would think a swarm this late would fail, but how does it work if the hive is re-queening itself? Yes. I didn’t know about the wasps eating the drones, so I was interested to see. I felt there wasn’t much point rescuing the drone, as he wouldn’t have lasted long away from the protection of the colony. I’m not sure I’d want to ever be a drone. They spend their whole life being nagged by a house full of women only to be kicked out when the fertility clock gets put to sleep for the winter. Rough life indeed. Being a drone early in the year would be best, when the drones can fly between hives sampling the different honey stores. Even the death in the sky seems preferable to slow death by wasp bites. With the warm winters you have, do your colonies kick out their drones? And what time of year do they do it? Of course, I remember that post now! It was interesting to see, mine usually wind down producing drones rather than killing the larvae off. I would be the first to admit that I don’t always understand why things are the way they are. I guess this is the best way for the bees to survive. 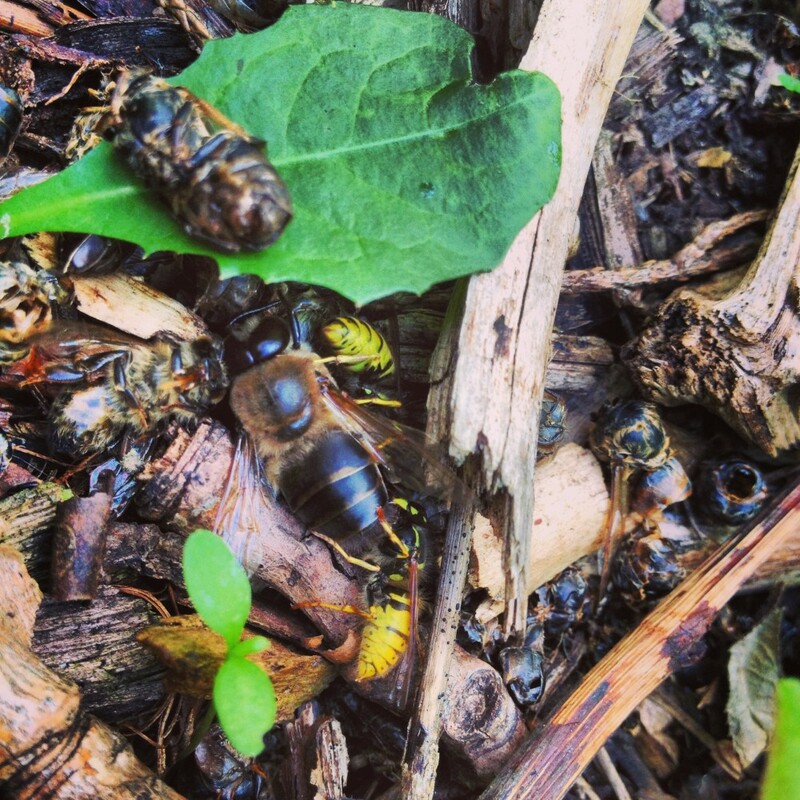 The workers don’t have an easy time of it either – the summer bees work themselves to death. I know what you mean. Once when I was inspecting a hive I spotted a drone being harassed by one of his sisters. I picked him up and removed him to a super, only for a different sister to resume the biting and pulling! Autumn is a poetic time, isn’t it? All the fading colours and sense of the year coming to an end. O man. Drones don’t have a dignified ending, do they? No, they really don’t. Getting eaten by a wasp makes having your testes snapped off by a queen seem like a bed of roses. Ha! Maybe they only feel half the pain. We’ve all been there Emily…! Nice post, always fascinating to see the year go by. Funny how London is not so far away but always seems to be a couple of weeks ahead in the cycle of the year, the Blackberries are still a way off here. 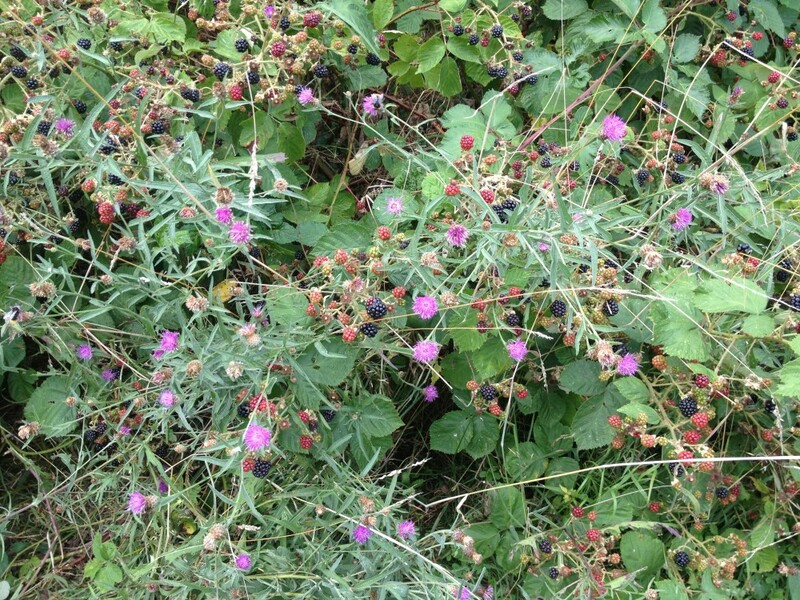 Yes, I was surprised to see the blackberries here in late July. Growing up in Luton I remember them coming out around September time. Poor Mr. Drones! Our hives right now are producing more drones because a big honey flow comes in during September-October. This weekend we are planning splits to prevent swarming. Yes, swarming in September! The work continues for you then! It’s just varroa treatments and feeding now for us until about March. 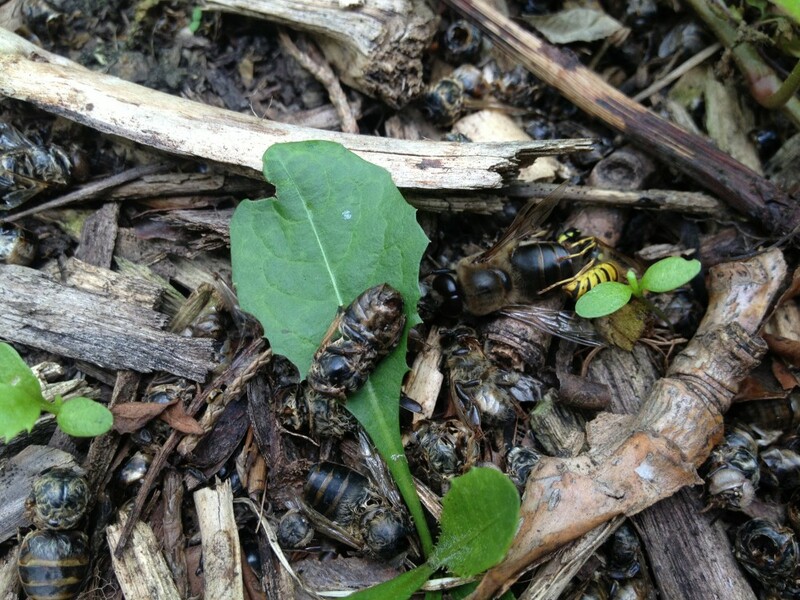 Sad ending for drones but a feast for the wasps. It really is the end of the summer, I suppose, it is coming too quickly. Yes. I’ll miss the bees. Sometimes I think I need them more than they need me. That sounds a little like the noise I make. I have no sting and I am very tame. As with my sperm I may pass on their genes. And maybe have a chance to copulate. I guess that swallows try to snap us up. And don’t give them a chance on me to sup. A queen is here! I get her lovely scent! I wonder what that danger warning meant? A thousand other drones here think the same. To mount while she’s a virgin is my aim! But once deflowered by me she’ll be a whore! If I’m first, she’s in luck; I’m the prize bull! She’s just upwind – I think I’m getting close. That’s her! I have her in my sight. I’m nearest, what is there to lose? Got her! I’ll mate with all my might. Love it! He found out what there was to lose. In a less indifferent world I would like to think there would be a Happy Retirement Hive for bloke bees who have ceased to be of use. Yes. They would while away their days supping on mead. I guess that’s the way to end a life when it’s good for only one thing: can’t forage, can’t sting…just hang out, being fed and waiting to mate. Nature figures everything out perfectly. At least he did some good for the wasps. Yes, poor old drone. At least he had a good life to begin with. So interesting, and yet sad. I don’t think anyone would want to be a drone, especially at the end of the summer months. No. He must have thought he had a great deal at first, being fed and waited on by his sisters, and then it all went wrong. There’ll never be another Attenborough! Oh to have that voice. It would have ended differently if only he had been packing . . .
I’m glad you put up the flowers at the end! But I never knew that drones met such a horrid end at the hands of their sisters. I suppose their sisters are thinking of their future sisters, who will need their honey stores to survive the winter and start again in spring. It is a very sad side of bee life though! I’m a bit late here, but had to say how much I loved this post. You can just here those sistahs now: Get out and stay out, you lazy good-for-nothin’! Thanks, and thanks for linking to my post from my blog too. The sistas are doing it for themselves now! 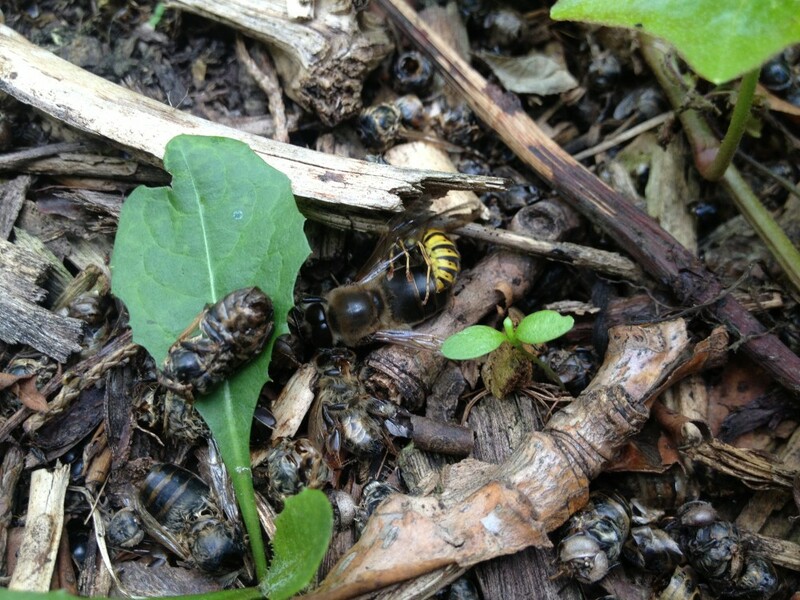 I think it was the second year that I had bees that they pulled all of the drones out of the colony seemingly at once, and a large mound of bodies pilled up just outside the entrance. The wasps and ants were very happy to come and clean things up for me! Aww poor drones! At least some creatures appreciated them. A treat indeed. Visual as well as ideas. Thanks.